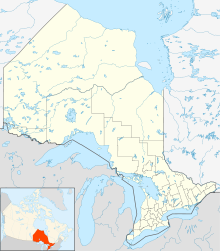 Port Perry/Hoskin Aerodrome, (TC LID: CPP3), is located 2.5 nautical miles (4.6 km; 2.9 mi) southeast of Port Perry, Ontario, Canada. The private airfield has a single 2,200 ft (670 m) turf runway located in the northwest corner of Shirley Road and Graham Road in the Township of Scugog. This page was last edited on 18 October 2017, at 05:16 (UTC).